Simon was a great tour guide. The Maori Cultural Show was nice, it was rainy this day so some of the show, which is usually held outdoors, had to be all done indoors. This tour would have been better with a sunny day, but still good. It was an all day excursion, but we could have stayed hours more! Our guide was so friendly and knowledgeable. We stopped at an incredible kiwi farm and of course had a kiwi ice cream. Seeing the Maori culture show was great and inspiring. Topping it all off with seeing the gyeser spewing and the gyser pools bubbling plus all the greenery and almost seeing kiwi birds at Rotorua. Stopped for pictures along the way at such a picturesque beach and saw rapids on a river. Spectacular day and would highly recommend it! Another great tour of NZ,Eight of us had a Great Day with our Coach Driver Simon Beaton, who was so very informative,and went out of his way to show us the Kiwi Fruit Orchard,on our way to Rotarua and Puia,and made us just in time to see the Guyser blow its Head of and the Steam Pouring out of the Rocks was magnificient returning us via another route on the Way back to Tauranga and the beaut Farm Land and Hills so green,reminds me of our Home State Tasmania.Cruise Tauranga really made our Day out, so much to see in a short time ,Keep up the Good work Boys n Girls. I am looking forward to tasting the Golden Kiwi Fruit some day in the USA. We enjoyed seeing first hand how they are growing the Kiwi Fruit and getting a fresh sample to taste. We learned about the local plants while viewing the Okere Falls. It was a secluded spot and it seemed like we were the only people there. The Geothermal Valley was an amazing site. Best of all the Maori Cultural Show. The performers displayed their passion for us. Best of all, our guide. She was the best guide we have ever had on any trip. What a difference a skilled, knowledgeable tour guide makes, particularly in multi-stop, varied locales. This was a remarkable, fun learning experience. At a beach, we learned about the earliest inhabitants. At a kiwi orchard, he took us into the orchard to show us details of how the fruit is grown and shipped. In a forest walk at a falls, he showed us plants with various medicinal qualities, even tasting one. 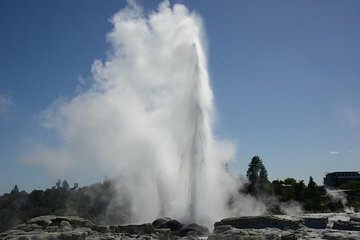 At Te Puia, he knew the best places for viewing, and monitored geyser activity while we attended the show, trying his best to time our walk through the geyser field with an eruption. A master educator at all times, the tour finished with a stop at a park in central Rotorua with a large number of hot springs. We covered an enormous amount of things on this tour, with no wasted time. By that I mean we ate lunch quickly at Te Puia, and a small amount of time was allotted either for some shopping there or to view additional cultural exhibits. This was, by far, the most interesting excursion in a three week vacation. I highly recommend it. Michele from LeRning Journeys was our guide for the 8 hour tour. She is amazing at her job. Such passion. Great tour ! Notre guide était très connaissance avec les coutumes Maori, ce qui était très intéressant d'en apprendre plus sur ce peuple de grands voyageurs! We booked this trip wanting to do and see more than we would if we paid for trip arranged by cruise company, and our expectations were more then met! There was small group in comfortable bus with great guide. Every stop was well timed giving good amount of time to see all we wanted to see. Great science backround of the guide made it very informative without being difficult to understand. We feel that the day was spot on when it comes to content, speed, sense of humor and variety. Absolutely loved it all. This was a great experience and saw so much. We watched Pohutu Geyser erupt, the falls were beautiful and got to sample Kiwi fruit. The Maori cultural show was very informative and fun shopping at the gift store. Had a great day with a very noligable guide.